Home/News/News/The Great Wallsend Copper Drop Thank-you! 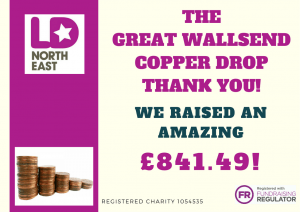 We are absolutely thrilled to announce the grand total for the first ever Great Wallsend Copper Drop – an amazing £841.49!! We’re also thrilled to announce that the Great Wallsend Copper Drop will be back next year! Be sure to put Thursday 2nd May 2019 in your diary!